53 years ago today, Chevrolet introduced the1959 El Camino to the automotive world and it hasn't been the same since. In direct response to the popularity of the Ford Ranchero, Chevrolet had decided it needed to stake a claim in the world of the automotive based utility vehicle. That is exactly what happened on October 16, 1958 when the 1959 Chevrolet El Camino officially went on sale. Although they were two model years late to the car/truck party (Ford introduced their Ranchero for 1957), they certainly made their debut year memorable. Featuring the extreme styling all Chevrolet passenger cars left the factory with that year, in El Camino form it looked even less of this world. Perhaps this is why the model only lasted through the 1960 model year. Three years later the El Camino was back with slightly more subdued styling and production of the unique vehicle continued until 1987. Regardless of whether you love it or hate it, if you know what an El Camino is chances are you have an opinion about them. In certain circles, the cars are celebrated for their unique design variations and the awesome custom cars they, along with the Ranchero have inspired. To others the El Camino is little more than a rolling advertisement that your house has wheels. Thousands of enthusiasts have called for the return of the El Camino to the US but so far efforts have so far been unsuccessful. There was a glimmer of hope when it appeared the Pontiac G8 sport truck was coming to America, but ultimately plans to do so were discontinued. 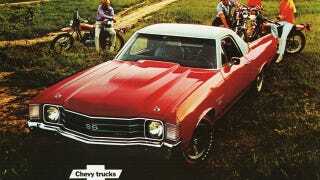 In celebration of the model's birthday we once again make our plea to GM executives—Bring back the El Camino.